With the possible morning sickness, a heavy, cooked breakfast such as bacon and eggs may sound distinctly off-putting for the expectant mom, but it would seem that this breakfast could really be good for her! 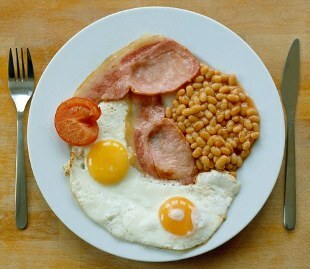 This traditional fry up and the nutrients found in eggs and bacon could protect babies from birth defects, according to the findings of a recent study. The study found that choline, which is an essential nutrient for the developing brain of the fetus, is found in egg yolks as well as bacon and organ meat such as kidneys and liver. Other sources of choline are leafy green veggies such as spinach, cauliflower, milk and wheat germ. Though choline is easily obtainable from food, one in four women is said to be deficient in this vital nutrient. Deficiency in choline could mean that the brain of the developing baby does not develop sufficient blood vessels, which could result in learning difficulties. Too few blood vessels could mean insufficient nutrition for the brain and hence improper development. Choline deficient women are 4 times as likely to have babies with birth defects. Choline is also necessary for proper cell working and growth and also helps to protect the body against high cholesterol and liver disease.